Includes 10' exhibit space with table and chair. Extra booth representatives can be registered at the discounted rate of $185 per person. Includes all conference materials, meals & Recycler of the Year Awards Reception for Monday, August 13, 2018 only. Early Bird pricing available until July 14. Online registration closes August 8, 2018. On-site registration requires an additional fee. Online registration available through August 8. On-site registration requires additional fee. 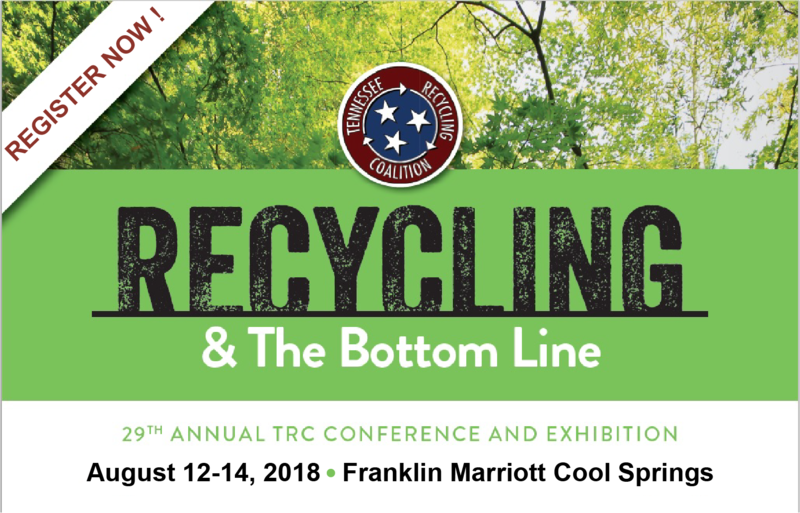 Join professionals from across Tennessee and throughout the Southeast at the Tennessee Recycling Coalition's 29th Annual Conference and Exhibition. Exciting sessions featuring industry best practices, community enhancements, creative reuse, and special announcements. Two technical tracks will provide in-depth information and focused discussion to help you maximize your conference experience.